If you have ever caught a deer in your headlights at night, you may have noticed an eerie, luminescent glow in the animal's eyes. This phenomenon is due to a series of special adaptations designed to help deer see in low-light conditions, and many other animals share some of these characteristics. When light enters your eye, it passes through your pupil, which regulates how much light strikes the retina at the back of your eye. There, the light strikes specialized receptors called rods and cones. Cones help you see fine details and colors, and work best in bright light. Rods help you see movement and broad details, and work best in low-light conditions. Humans and other daylight animals tend to have more cones, while animals who shun daylight typically have more rods. Some nighttime predators have virtually no cones at all, relying on sudden movements to spot prey and launch their attacks. The structure that causes glowing eyes in deer, dogs, cats and other animals is the tapetum lucidum. This is a layer of specially adapted cells behind the retina that reflect light. When light passes into a deer's eye, it strikes the many rod receptors in his retina, helping him identify the movement of potential predators. The tapetum gives his receptors a second shot at those rays of light, however, reflecting them back through the retina and doubling the chances of any rod receptor gleaning information from the outside world. When a bright light shines on the tapetum, it reflects a bright glow that can be seen from a distance. 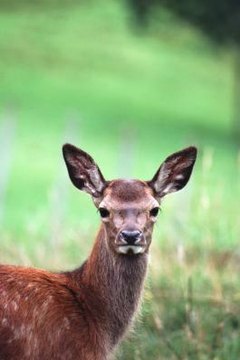 Since deer are largely crepuscular, active during dawn and dusk, their eyes have larger pupils than animals who spend most of their time awake during the day. This exacerbates the glowing eye effect, since in the darkness, the pupil can expand to cover most of the front of the eye. This reveals much of the shiny layer beneath the retina, enhancing the glowing effect. The eyeshine of animals varies even within the same species. Depending on genetics, diet, injury and other factors, the glowing eyes of one deer may be vastly different than the glowing eyes of another. In some cases, a veterinarian can use the tapetum to diagnose potential vision problems, as an occluded glow may indicate a problem with the retina or a cataract that may be blocking the passage of light in and out of the eye. Biomedia Associates: How Do Animals See in the Dark? National Public Radio: Why Do Animals' Eyes Glow in the Dark?